From Greek eironeia to Latin ironia to Old French to French ironie which signified "deliberately pretending ignorance, particularly as a rhetorical device to get the better of one's opponent in an argument". A condition in which something happens which is undesirable and a strong sarcastic statement is made regarding that incident: Mrs. Black said a bitter irony when her husband gave her a mop and bucket as Christmas presents. © ALL rights are reserved. 1. Characterized by or constituting sarcasm: What a beautiful view, George said, as his ironic statement referred to the view of the alley in the back of his hotel room. 2. Description of the outcome of events contrary to what was, or might have been, expected: Jill thought it was ironic that computers break down so often since they are supposed to be a faster way of getting written materials completed. The news article Hank was reading described the ironic crashing of the robber's car into a police station. It was an ironic turn of events when Bessie and Bert became close friends after their marital divorce. 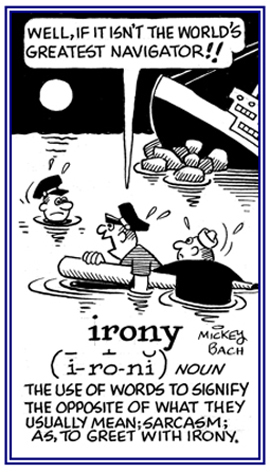 Irony differs from deception in that the ironist intends for the listener to reconstruct his or her attitude from the ironic words that are spoken. 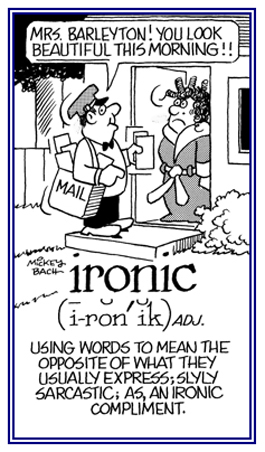 It has long been noted that ironic statements are frequently spoken with a marked intonation, often termed "the ironic tone of voice". It is ironic luck when a man gets wonderful poker hands when he plays bridge. 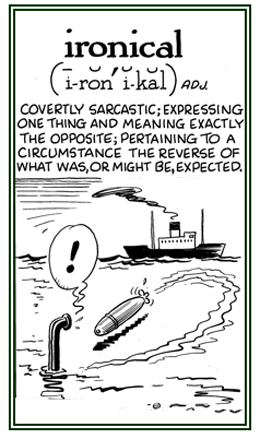 —Compiled from Esar's Comic Dictionary by Evan Esar. A reference to that which is contrary to what was expected or intended: It was an ironical situation when Gilbert made himself sick by worrying so much about his health. Lee made an ironical statement when he said: "It's raining cats and dogs, but it's lovely weather we're having, isn't it?" A description of what is strange or funny because things happen which turn out to be the opposite of what a person expects to happen: Mike and Mildred were ironically confronted with having plenty of money for food, but they couldn't buy it because the restaurant didn't have any table available for them. One ironically disturbing experience was when my neighbor Alfred, who had been poor all his life, inherited a fortune after becoming too old and too ill to enjoy it. Such a situation may be characterized as "the irony of fate", or "one of life's little ironies" and here the word "little" is itself being used ironically. A person who uses language that normally signifies the opposite; typically, for humor or to emphasize a point: Susanne was an ironist who used words that were funny because they were not what she really meant. Herbert is an ironist who brushes his teeth with "tongue in cheek". Ironists are people who strike when the irony is hot. 1. The use of words to express something different from and often opposite to their literal meaning: As Jamie walked away from the clerk, who had spent a lot of time helping her without indicating her appreciation, he said with irony, that she was very welcome. Irony is an insult presented in the form of a compliment. 2. 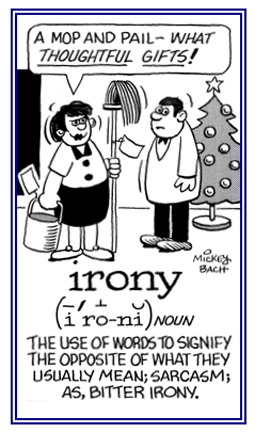 An expression or utterance marked by a deliberate contrast between apparent and intended meaning: Irony is a literary style that employs various contrasts for humorous or rhetorical effects. 3. Something that happens that is inconsistent with what might be expected to happen; especially, when this seems absurd or laughable: It was with a sense of irony that Richard turned down the job that he was striving so hard and for so long to obtain. What irony to be offered three jobs after having been turned down every time for over two months. Irony is an expression of something which is contrary to the intended meaning; the words say one thing but mean something else. Here is a classical example of an ironic statement as seen in William Shakespeare's Julius Caesar when Mark Antony ironically stated: "Yet Brutus says he was ambitious; And Brutus is an honorable man." Irony is saving something for many years and then getting rid of it just before it is needed. A situation in which something happens that is very desirable in itself, but it is so badly timed that it isn't of any use or it is no longer an advantage: By an irony of fate, although Joseph had been living in poverty all of his life, he inherited a fortune; however, he was so old and incapacitated with an illness that he could not enjoy it. The use of contradictory expressions in a drama; originally, in Greek "tragedies": Tragic irony is present in some plays making it possible for an audience to be aware that a character's words or actions will bring about a fatal result, while the character is someone who apparently doesn't know that it is going to happen.